Our piano display is open to welcome visitors 12 hours per day 7 days per week. We invite serious buyers to come by appointment. This enables us to ensure that they can try pianos without interruption. We can if required provide demonstrators, but our normal practice is to spend a few minutes showing clients the available instruments and describing their features. We then leave them to play and experiment without the pressure of a salesman in attendance. Our display is principally Steingraeber, Phoenix, Boesendorfer, the better models of Steinway (Hamburg only), Bechstein and Bluthner. We aim to offer only the finest instruments, prepared to highest standards, but at competitive prices well below those sought almost anywhere else. This is not inconsistent with viable trading because by doing this and thus gaining trust and respect in the market we have been able to achieve a uniquely high turnover and are able to run a modestly profitable company with our resources focussed on giving efficient and professional service rather than spending on a flashy façade in expensive premises. The fact we are located on a picturesque farm enables us to attract top grade staff who would be unwilling to work in the rat race of urban business. Unlike most other piano outlets we have fixed showroom displayed prices, which are reviewed periodically to account for currency fluctuation. 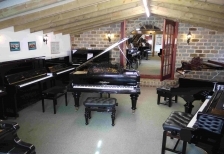 Visitors to Hurstwood Farm Pianos Studios know what they will be asked to pay. We do not give discounts (except for multiple sales). All our clients pay the same for the same product, because as with traditional practice, our prices are not negotiable. They are already at the lowest level we can manage consistent with keeping a viable business. Selection, set-up and maintenance are three key aspects in achieving performance from any piano. Set- up is the process in which each instrument is adjusted to its optimum performance within the artists preferred feel and to the environment in which it will be played. All new pianos which come to us from the factory are only partially voiced and may sound a little harsh or strident. The reason for this is that it is possible to soften the tone of a piano but it is difficult to restore brightness once this is done. Final voicing is therefore always done in the place where the piano will be kept after sale. Voicing is a highly skilled job. The best pianos are rarely the most expensive. In the European market the price tends to follow how well known the brand is to the public rather than the quality of the product. The ex factory cost of all the leading quality makers is roughly the same. Trading practice generally is such that there are wide differences in the relationship between factory cost and the recommended retail price. Retail price is often inflated to allow for “subsidy” or other sales promotion devices at the expense of the private buyer. We set our prices by the same margin on factory cost for all makes. Special build pianos are produced in small numbers and are craftsman made from traditional materials of exceptional specification. Exclusive production of this kind is costly, but in our opinion these pianos are even better value for money for the most discerning client who seeks the ultimate piano. 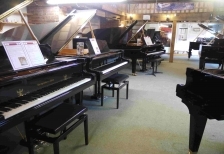 We can deliver any of the pianos in stock worldwide. (Please note we do not offer after sales overseas. Warranty on new pianos is limited to parts only on exports). Atlantic Music Center of Melbourne, Florida are the licencees for the Phoenix bridge agraffe system in North America. Retro-fit installations in used pianos and some new instruments with the Phoenix system can be obtained directly from them. 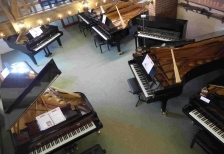 Phoenix brand pianos can be purchased directly from Hurstwood Farm Piano Studios.